Kennedy John Victor (Known as Vikram or Chiyaan Vikram) is an Indian film actor, producer, playback singer and voice actor. He predominantly appears in Tamil language films. He has won seven Filmfare Awards as well as one National Film Award and Tamil Nadu State Film Award. He was awarded an Honorary Doctorate by the People's University of Milan in May 2011. 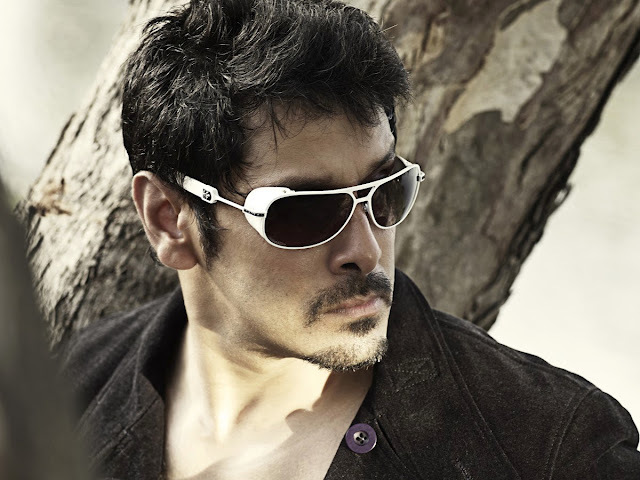 Vikram was born as Kennedy on 17 April 1966 in Chennai, Tamil Nadu, India to John Victor and Rajeshwari. He has a younger sister named Anita, who is a teacher and a younger brother named Arvind. He did his schooling at Montfort School, Yercaud, a boarding school in Yercaud. The school presented him with ample opportunities for extracurricular activities such as karate, dance and swimming. He completed his graduation in English from Loyola College, Chennai after which he also completed his MBA degree. Vikram began his career by modelling in various television commercials for brands including Chola Tea, TVS Excel and Alwyn watches. He made his television debut with the Doordarshan series Galatta Kudumbam, which aired between November and December in 1988. He made his film debut in 1990 with the Tamil film En Kadhal Kanmani, which was directed by T. J. Joy. His first Malayalam film was Dhruvam(1993), directed by Joshiy. He made his Telugu debut in the 1993 film Chirunavvula Varamistava. He has acted many commercial successful Tamil movies such as Sethu, Kasi, Gemini, Pithamagan, Anniyan, Raavanan, Deiva Thirumagal, Thaandavam, I, Iru Mugan etc. Apart from acting, Vikram has also been a part of other film-making processes with credits as a playback singer and as an assistant director. He got married to Shailaja in 1992 at Guruvayoor. The couple has a daughter named Akshita and a son named Dhruv.